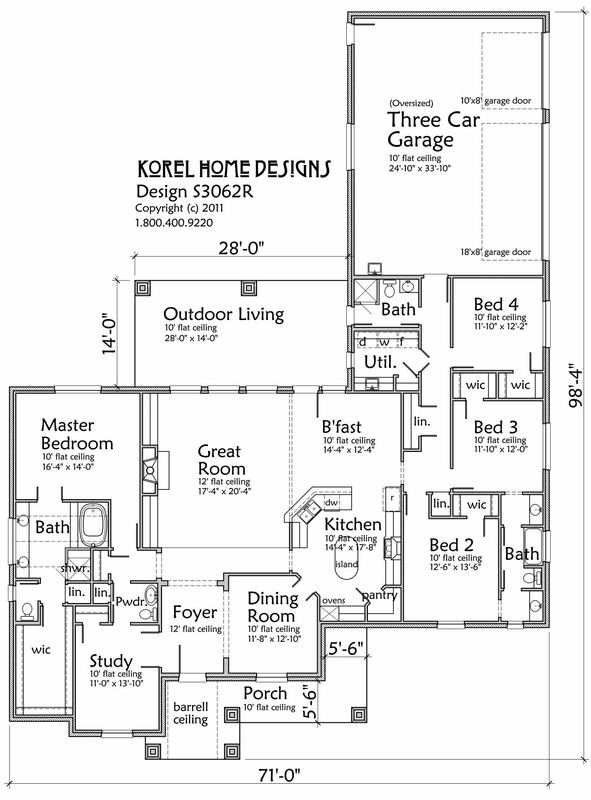 Our Design S3062R is a wonderful four Bedroom with a Study, three and a half Bath, Island Kitchen, Three Car Garage Family Home with a large Outdoor Living Area. Your Great Room/Living Room has a 12′ tall ceiling and is 17′-4 x 20′-4 and that doesn’t include the walk-way between the Master Bedroom Hallway and the Kitchen. Speaking of your Kitchen, you have a 36 x 68 Island, a 48 x 48 Pantry, Double Ovens and plenty of Eating Bar area. All Bedrooms have walk-in-closets. There is plenty of extra storage in the Hallways for Linens. There is a Cabana Pool Bath opening to the Outdoor Living Area. You have built-in cabinets on both sides of the Fireplace. Enjoy outdoor living with the Wrap Around Front Porch. All Bedrooms have 10′ high ceilings, 8′ tall doors and the Great Room and Foyer has 12′ high ceilings. The roof slope is an affordable 8:12 roof pitch.